I've had a lovely bloggie break, but I missed you all! I'm coming back today with a What's On Your Workdesk? Wednesday (WOYWW) post because it's always fun to share the kind of covering that I have all over my desk today: beautiful birthday cards from so many of you!! I want to again thank Ardyth for hosting a surprise linky birthday party for me and Bev for providing all the virtual refreshments and good food and decorations, and all of you that joined in! I have made a Pinterest board for all the gallery cards and the cards I have received in the mail. The cards that have been sent have also been added to my Happy Mail tab above. You have more than spoilted me this year! Mwah!! Aren't they fantastic?! You can find a video on how to make them via the above link to Dianne's site. Thank you, again, Dianne!! I'm very behind on introducing new friends to you, so I can't miss this opportunity to welcome five more! Marilyn S. of One Stamping Fool. Marilyn has been blogging since 2009 and I guarantee you will find her cards sparkly and full of life, just like she is! She is a designer and award-winner and brilliant colorist. You will stop in for a minute and just keep on reversing back through her posts for hours and hours! Vickiebryn (hamptongal) of Vickie's Scrappings. Vickie is a mother of three and grandmother of six and she has been blogging since 2011. She doesn't post as often as we'd like, but you are bound to find something to inspire you from her wonderful cards, projects, and scrapbook layouts! Glenda Marklew of My Paper Cat. Glenda lives in South Africa and she is a primary school teacher. She has only just started her blog last month, so I know you will all make a special effort to visit her, welcome her to Blogland, and leave her some encouragement! Glenda's card art is unique and amazing in that there is normally incredible stitching of some kind on her cards. They are breathtaking! Lisa of Lisa's Creative Niche. Lisa has been blogging since 2010. She is a SAHM to two beautiful young children and fortunately for us, she shares her scrapbook layouts of them! She is a designer, award winner, and published card artist ... I think that says it all! Margaret Rorie of Island Scraps. Like Glenda, Margaret is also a newcomer to Blogland, having started her blog in March in order to play in challenges. She is retired and she is a great challenge player. I'm sure her card art will be featured often in the future! Her CAS cards are impeccably made and beautifully designed! Thank you for joining, ladies, and welcome to the Playhouse! Thank you, too, to my many newcomers who are subscribing! I know you are there, even if I can't see you to introduce you! A few of them bear closer inspection to leave you with some chuggles and gickles! Inside: "Getting older is fun if you do it with the right people." Inside: "Going over the hill is more fun when you go with friends!" Inside: "So get out there and show off your favorite package!" I hope to see you on the WOYWW hop! If you want information regarding WOYWW, the above link will take you to the wonderful blog of Ms. Julia Dunnit, Headminister of Desk Affairs. I'll be back soon with a handmade card of my own. I've missed making them and playing in the challenges! Belated Happy Birthday Darnell...that's a whole heap of cards! The ones at the end made me laugh a lot! That's the sort of card I head for at the shops...Julia and I often snigger very loudly when we're choosing ones like those! Haha good to see you back Darnell, and I did chuckle more than once reading through! First welcome back - second, fab display of cards. Now what was I going to say on here? Can't remember as I got carried away laughing at those cards at the end. So glad you enjoyed your break and its good to have you back. Loved those fun cards but the one about peeing and farting might be getting a little too close for comfort!!!!! Seriously cracking up at the sentiments on the store bought cards. Hilarious! WOW - what a birthday haul of cards to treasure there Darnell. Just shows how wunnerful you are and that the Law of Attraction is working just fine. 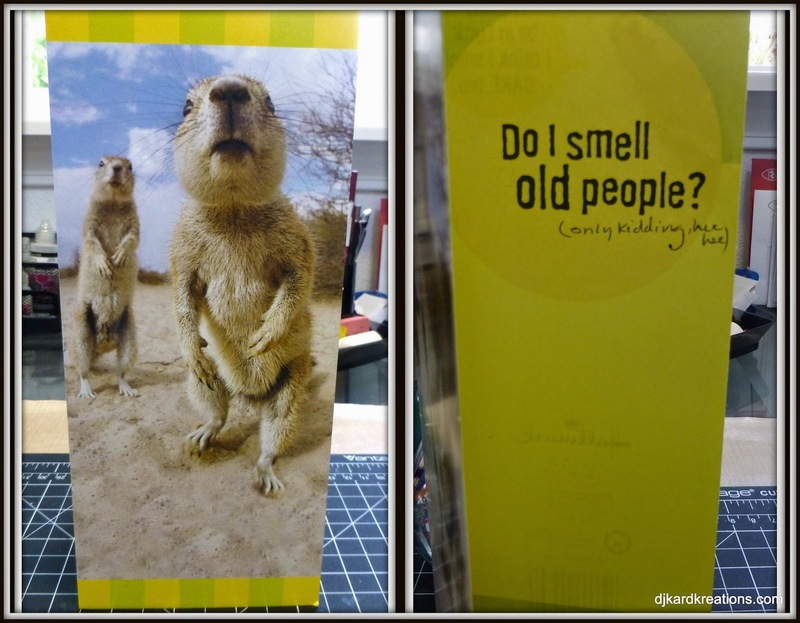 Was having a gickle at the humorous shop cards and inside sentiments! Glad you had a great birthday and time away from the blog. You've been missed! I didn't see my card I sent you on your table. Shoot. I was hoping it would have gotten there by now. It's been over a week. But it can take awhile. Well, hopefully it's there now or will be soon. :-). Looking forward to your regular post again! :-). Hugs! WB from your bloggie break, and golly it's good to hear from you again! I missed my daily chuckles ;) These cards are hilarious! ROFL! So glad you are back, Darnell! Blogland is just not the same without your posts! Thanks for sharing your birthday cards! Those funny sayings were hilarious! You are much loved, Darnell! Happy belated Birthday to you, my dear! Your collection of cards is fabulous! Chuggles and gickles, indeed! I laughed so hard...not sure much oxygen was getting to the brain, but it's all good. ;) I have been busy cleaning my craft room and finally have some new craftiness out on my desk. Yay! Brilliant, Darnell. Where do people find them!!??!! Sounds like you have had a fabulous birthday. Congratulations. SO glad that you had a wonderful break, but glad that your back :-) I love when the birthday celebrations keep on going lol! Thanks for the chuckles this morning! Those cards are too funny! 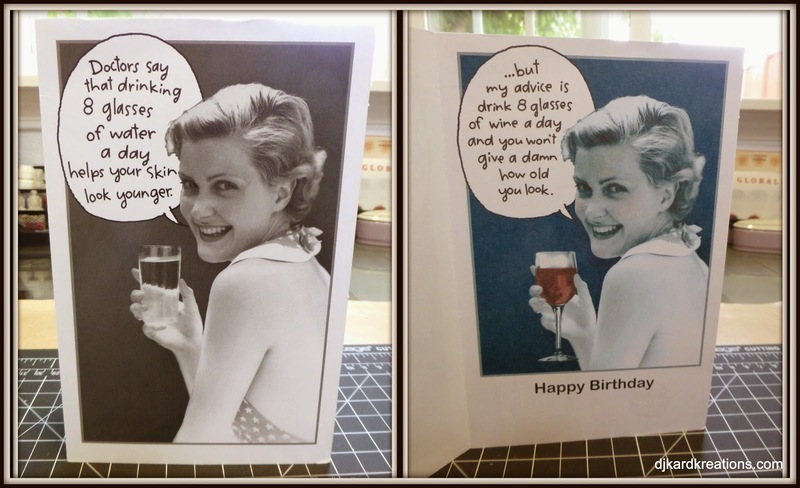 I LOVE seeing all of your pretty birthday cards lined up, but the store bought cards are a HOOT!!! What a wonderful collection of birthday cards. I don't think I've seen so many sent to an adult. They'l be a fantastic inspiration to you in the days to come. Welcome back! You are loved! Nice to see some cards with such a wicked sense of humor! Loved them and thanks for sharing Darnell! Have a great day! SQUEE!!!!! All those cards! Such fun! You just keep on celebrating until the next one comes along! I love the store bought cards, such fun. There are some real gems out there. I'll have to spend some time perusing your happy mail gallery. Your Burpday was as good as mine by the sounds of it Daaar-nell! Glad you are back to crafting, although it means I shall have to get cracking again. I ammm sooooo slooooow! Well, some of those cards made me laugh so hard I almost peed my pants. Welcome back...I've needed a good laugh lately. But I have to go now to change my undies. What fun, Darnell! All the Birthday cards and happy wishes make getting older a little bit easier, eh? That's a great collection of cards Darnell. Pleased you are back with us. Best laugh I've had all day, Belated wishes kid-o! So very glad that you are back!! And I am so impressed with the way you were showered with so much love and cards for your birthday!! It is so well deserved because you leave sparkle wherever you go and make impressions on people's hearts that can never be erased!! Have a beautiful day!! Welcome back, Darnell. While I love homemade cards, there something to be said for the silly ones that you buy, and that you posted. Bwwaaaa!!! Those cards are too funny!!! I am glad you had a fantastic birthday Darnell and you got such lovely cards. Thank you for making me laugh tonight!! I love coming here because not only will I get a chuckle but I always get to check out some new blogs. Have a fabulous night!! Glad you're back, Darnell! Hope you had a great time with your friend! What a fabulous array of cards and gifts ... Some of the shop bought ones really gave me a chuckle! Have a lovely day! Now I see what Carol means by "Daily Chuckles". OMGosh, my sides are splittling! Welcome back. What a great collection of cards, Darnell! Happy belated birthday, and happy belated WOYWW too! Thanks for your return visit, Darnell, and for your wonderfully encouraging comment! What a wonderful array of cards and the funny ones are great, and dang it if they aren't so true, too!! Glad you had a great birthday!! I'm so happy you enjoyed your birthday and got lots of love from all your friends. I hope you had a great time with your friend. I'm glad you're back with us and giving us our dose of humor. Your funny cards are great, love them all. What a GREAT selection of birthday cards!! Now, when is your birthday exactly?!? Don't you love the cards with the vintage images and great sayings. You have to enjoy a friend with a sense of humor. I read the post about and really enjoyed the story of the spider in the bathtub. Very clever!! Happy WOYWW and Happy belated birthday. Wowsers, did you get a lot of cards! Deserved every one of 'em too! Enjoyed seeing the store bought ones - they were a hoot. I'm envious of how tidy that workspace is. Do you make housecalls? Could I afford your per-hour charge? Maybe Hammy could fly over and help? Are his rates a bit less? Whatever! TFS & Hugs. Glad you're still enjoying the birthday! P.S. Your cards were nice, too. I am still laughing and having difficulty typing at the same time. These cards are just too darn funny, I love them all. Some totally wonderful birthday cards - lucky you! Happy late BD! Hugz! Happy belated birthday greetings! What a great post... fun, fun, fun! Also, thanks for the shout-out about me and my blog. What a great collection of cards you received there...and thanks for sharing the pics so we could enjoy them too. Before the kiddos I would spend hours in the card stores..just enjoying them. Thanks for the close-up of the fun quirky ones. I don't see that too much in the handmade card world. Okay, nearly spilled my coffee, laughing over these cards, and that would not be a good thing, as the vacation rental owners would be unimpressed! Anyway, I've recomposed myself somewhat; down to snickering only. Welcome home, Darnell! Wonderful to have you back! Your post and photos - a fantastic Monday morning treat! Hello Miss Darnell all those cards on your desk show how loved you are, you are easy to love,you deserve it all.. Your ATCs look fab in the booklets, I looooooved making them for you, thanks for sharing and being one of the sweetest Ladies I know..
Great collection of cards, you have lots of friends! And some really fun cards, too... I'm crying with so much laughter.